It is off the beaten path along the East Cape and perfect for those wanting seclusion. Shipwreck Beach was named after an actual offshore shipwreck that has since been removed. This uncrowded surf spot along the Sea of Cortés has a great right-hand point for surfers. 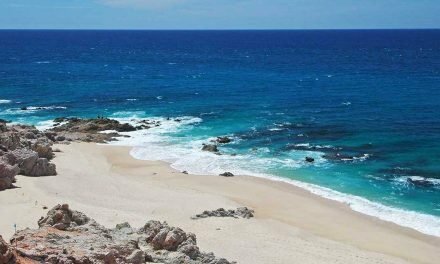 It is about a 40-minute drive from San José del Cabo. There are few restaurants on the East Cape, so bring a cooler and shade. Vehicles with off-road capabilities are best for the rougher terrain. Shipwreck is just south of a small development named Rancho Rocas del Mar. 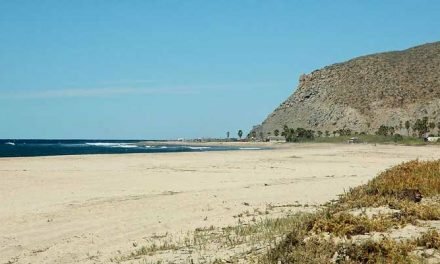 Other notable beaches farther up the cape are Nine Palms, Punta Perfecta, and Los Frailes. Excerpt from Los Cabos Magazine Issue #24, April 2011: Located below the small bluffs a few miles south of Playa Higuera. A big sandy beach with a right reef break at the south end, great for surfing and picnics! 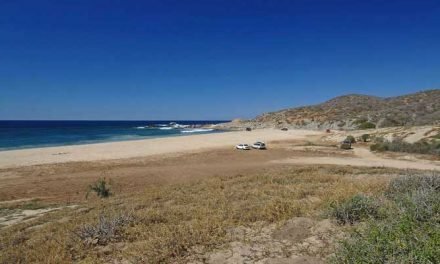 There are no services from San Jose del Cabo to north of Cabo Pulmo. You will find some of the most amazing coastal scenery you can imagine. The first named break is Shipwrecks. There is no longer a shipwreck here, which makes it difficult to locate. Keep your eyes peeled for Rancho Rocas del Mar. Shipwrecks Beach is located to the south. If there is not a strong south swell you probably do not want to make the drive unless you are satisifed with simply seeing the beautiful scenery of the East Cape.